the dilation within the major duodenal papilla that normally receives both the (common) bile duct and the main pancreatic duct. A small dilatation in the main duodenal papilla which corresponds to the joining of the common bile duct and major pancreatic duct; the AoV appears as a bump in the duodenum by endoscopy, is the point of secretion of bile and pancreatic juices, and is the target for injecting contrast when performing ERCP. The dilation at the junction of the common bile duct and pancreatic ducts before they enter the duodenum. A small sac-like widening (dilation) at the point of junction of the bile and pancreatic ducts where they enter the DUODENUM. Cancer of the head of the PANCREAS can block the ampulla and cause obstructive JAUNDICE. 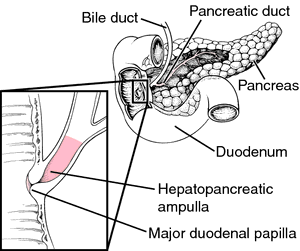 The widened portion of the duct through which the bile and pancreatic juices enter the intestine. Ampulla is a Latin word for a bottle with a narrow neck that opens into a wide body.